Most Christians believe that Jesus is God and worship him as part of the Trinity. But what did the New Testament writers say about worshipping Jesus? Did they view him as God, as someone we should worship? Are Christians today guilty of what Dunn calls ‘Jesus-olatry‘? In this new book by James D.G. Dunn, (Emeritus Professor of Divinity, Durham University and author of numerous ground-breaking works) he examines the key New Testament texts and the arguments of the most influential recent interpreters. Dunn’s first concern is with the language of ‘identity’. In traditional christology the concept of ‘person’ (God is three persons in one God) is highly problematic since our usual understanding of that term today is very different from the technical understanding of the Latin word persona, a term devised to provide a way of distinguishing between Father, Son and Spirit with in the Trinity. The Latin persona means basically a mask, as used by actors in a play which represented the character being played; and so by extension it came to denote the ‘character’ itself. Dunn thinks that ‘identity’ language runs the same risk. He concludes, ‘The New Testament writers are really quite careful at this point. Jesus is not the God of Israel. He is not the father. He is not Yahweh. An identification of Jesus with and as Yahweh was an early attempt to resolve the tensions indicated above; it was labelled ‘Modalism’, a form of ‘Monarchianism’ (the one God operating first as Father then as Son), and accounted a heresy.’ pp 141-142. ‘If what has emerged in this inquiry is taken seriously, it soon becomes evident that Christian worship can deteriorate into what may be called Jesus-olatry.That is, not simply into worship of Jesus, but into a worship that falls short of the worship due to the one God and Father of our Lord Jesus Christ. I use the term ‘Jesus-olatry’ as in an important sense parallel or even close to ‘idolatry’. As Israel’s prophets pointed out on several occasions, the calamity of idolatry is that the idol is in effect taken to be the God to be worshipped. So the idol substitutes for God, takes the place of God. The worship due to God is absorbed by the idol. The danger of Jesus-olatry is similar: that Jesus has been substituted for God, has taken the place of the one creator God; Jesus is absorbing the worship due to God alone.’ p 147. So Dunn effectively takes issue with the great christological statements of the councils of Nicea and Chalcedon and joins the ranks of the unitarians in affirming a simple monotheistic theology. But his conclusions have far reaching implications for orthodox Christianity which stands condemned as promoting the serious sin of idolatry in its worship of Jesus as God. 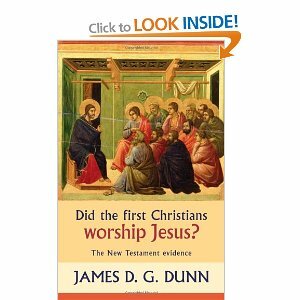 The other great monotheist faiths, Judaism and Islam, have always claimed that the worship of Jesus constitutes a denial of Christianity’s claim to be a monotheistic religion, but Dunn in his conclusion seems reluctant to take on board the effectiveness of these critiques. I believe the only alternative religion that claims universality in its scope is Islam, which offers an appropriate evaluation of Jesus as Messiah, prophet, messenger and Word from God without falling into the errors of ‘Jesus-olatry’ (Christianity) or a denial of the divine mission of Jesus of Nazareth (Judaism). All Christians should read this book, and Muslims too will find much to benefit their dawah. VERY SAD book… It is FULL of errors…. my reply is to the author of this article above…. TOTALLY disagree! It’s one of the most important books anyone of the Orthodox Christian faith should read! I can’t find any “error” in Dunn’s book at all! Very UNsad! Never mind my post I got confussed by reading it to fast…. MBI3030 do you have something intelligent to say about Christology and the early Christians? To miss all these is to misread Dunn’s work. Mr. Woo – It must be noted that your “uniquely Trinitarian” comment above is yours and not Dunn’s. Nowhere in the book does Dunn ever note that his conclusions are “uniquely Trinitarian”. To assert that is to “misread Dunn’s work”. Classic, Orthodox Trinitarianism would have us believe, for example, “7. Such as the Father is, such is the Son, and such is the Holy Spirit. 8. The Father uncreated, the Son uncreated, and the Holy Spirit uncreated.” (Athanasian Creed) In any of the works of Dunn that I have read, he never seems to agree with such “uniquely Trinitarian” language, including the book in question. If Christian worship can “deteriorate” by worshiping the Lord Jesus which is due unto God alone I’d like to know if Christ’s first followers would believe that since right after His ascension they worshiped the Lord Jesus in prayer in Acts 1:24, 25 and even ascribed to Him omniscience (an attribute God alone has) by referring to Him as “kardiognwstes”. So Peter testifies that he is man not God, he clearly distinguishes between the two. You make a false dichotomy. Don’t just choose where the Scripture teaches that He is a man while ignoring those that teach He is God. Those who teaches that Jesus is god are SETAN. The OT proves already that Jesus was a prophet and which concluded that he is a MAN!!! Deuteronomy 18 I will raise up to them a PROPHET of their brethren, like thee; and I will put my words in his mouth, and he shall speak to them as I shall command him. 19 And whatever man shall not hearken to whatsoever words that PROPHET shall speak in my name, I will take vengeance on him. The verses above confirms what Jesus was AND ALSO DESTROY CHRISTIANITY!!! This Truth will prevail as Allah promised , with us Muslims or without us , He just wanted to give us the honour of calling people towards him. It was an amazing dodge to what I have previously written. He is ignoring the fact that the Bible teaches that the Lord Jesus is the proper recipient of prayer/worship (Acts 1:24, 25; 1 Corinthians 1:2 – and many other passages) which prove that He is God.